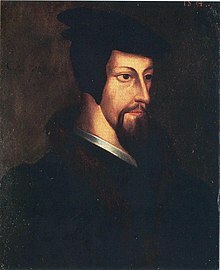 John Calvin (/ˈkælvɪn/; French: Jean Calvin, pronounced [ʒɑ̃ kalvɛ̃]; born Jehan Cauvin: 10 Julie 1509 – 27 Mey 1564) wis an influential French theologian an pastor durin the Protestant Reformation. He wis a principal figur in the development o the seestem o Christian theology later cried Calvinism, aspects o which include the doctrine o predestination an the absolute sovereignty o God in salvation o the human soul frae daith an eternal damnation. ↑ "Calvin". Random House Webster's Unabridged Dictionary. This page wis last eeditit on 6 November 2018, at 10:07.